The Mediclinics Dualflow Plus provides a premium experience in every respect. It is very fast, quiet and pleasant to use. It is very eco-friendly, requiring only 20% of the energy needed to power conventional hand dryers. And it is an ultra-stylish unit with a choice of two designer finishes. On top of these outstanding features, the Mediclinics Dualflow Plus adds anti-bacterial surfaces and optional odour control tablets to create an even more hygienic and pleasant washroom environment. Dries hands in 10 to 15 seconds. Let’s face it – the Dualflow Plus looks fantastic. It shouts prestige, style and state of the art. It’s green credentials only make the experience more satisfying. A Mediclinics Dualflow Plus makes a statement about care for your clients and care for the environment. Two designer finishes make the Dualflow easy to fit into any interior design – and look amazing. And the option of adding an odour neutralization system, enhancing the entire washroom environment, is all class. 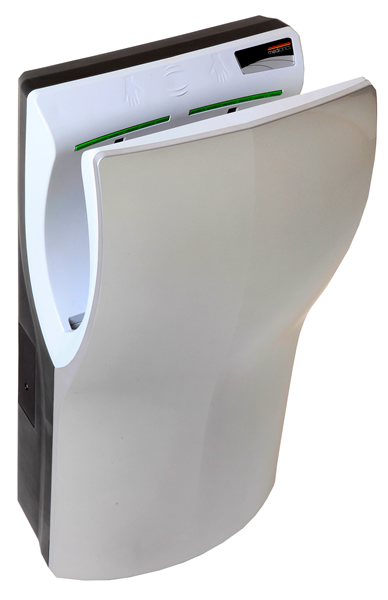 Reduces electricity usage by around 80% over conventional hand dryers. Purchase price is much less than the leading competitor. Slashes cost per use by 99% compared to paper towels. Long life reduces total cost over time. High quality components and the best warranty in its class make the Dualflow Plus a sound investment. 5 x more energy efficient than conventional hand dryers. 10 x more energy efficient than paper towels (life cycle analysis). Up to 20x more CO2 efficient than paper towels. Use of a renewable electricity source will reduce environmental impact even more. No waste means no landfill issues e.g. a ten-storey office building can produce over 9 tonnes of paper towel waste per year. Paper towels can not be recycled for hygiene reasons. Paper towels also require the consumption of trees, toxic manufacturing emissions, waste generated by packaging, transport pollution and many other factors associated with manufacture, delivery and waste removal. The total impact of these factors far exceeds those associated with hand dryers. Antimicrobial surface treatments kill pathogens for the life of the unit. Water droplets are captured, rather than recirculated around the washroom. Fast drying, low noise and a pleasant drying experience means more people actually wash their hands. This alone makes a significant improvement in hygiene. On top of this, they leave the washroom with hands that are completely dry, rather than half dry; which is yet another benefit. The Mediclinics Dualflow Plus has the best warranty of all high speed machines in Australia (apart from the Mediclinics Speedflow, of course). In fact, the Dualflow Plus has a better warranty than most conventional machines. Casing is a very solid, 3.0mm thick, high impact ABS. The Mediclinics Dual flow projects only 226.0 mm from the wall (compared with 247mm for the leading competitor) creating less of a hazard, and the proximity of the base of the unit to the floor makes it detectable by blind people using a cane. Activation is automatic and the ergonomics of use all combine to make the Mediclinics Dualflow Plus a natural choice for disabled washrooms. The Mediclinics Dualflow Plus has an optional odour control system, which enhances the entire washroom environment. The odour neutralisation tablets have an extended life span, reducing maintenance requirements. The Mediclinics Dualflow Plus is a ultra-modern unit that will enhance any environment it is placed in. It looks, and feels modern, smart and prestigious. It is very fast, and produces much less noise than the leading competitors. There is no heater element, reducing the heat load in the washroom. The unit is, a very light, 8.3 kilograms, making it easy to locate on various wall types. The Mediclinics Dualflow Plus comes in a choice of two designer finishes; white and satin. The Mediclinics Dualflow Plus, above all, is a high quality machine. It is designed and manufactured in Europe to the highest standards, with all components sourced in Europe. Because of this, it has the best warranty in the country. 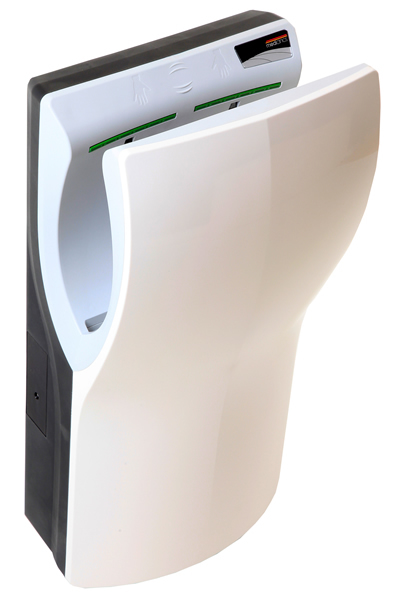 The Mediclinics Dualflow Plus brings a new approach to high-speed hand dryer design. The effect of this is completely dry hands, all over, within 10 to 15 seconds. The experience is enhanced by the fact that the user is not being exposed to ridiculous noise levels – the Mediclinics Dualflow Plusproduces less noise than the most advertised brand. The Mediclinics Dualflow Plus also incorporates additional hygiene features. The operation of the unit is hands-free, and the water from the hands is collected, rather than redispersed throughout the washroom. All surfaces of the Mediclinics Dualflow Plus that are exposed to water have an anti-microbial agent, Biocote, embedded in them – killing pathogens for the life of the unit. And all of this is delivered in a package that costs much less than the leading competitor, with a better warranty. The Mediclinics Dualflow Plus is all class. The unit has been designed from the ground up; leveraging all of Mediclinics accumulated knowledge to exploit the very best of modern technology. It is very fast, very quiet and very energy efficient. It is a high quality machine, with the best warranty in its class. 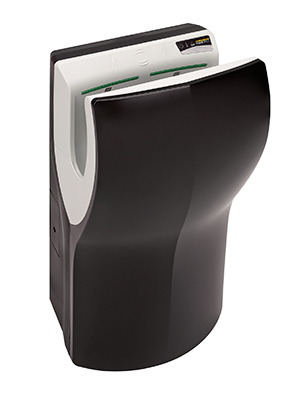 The Mediclinics Dualflow Plus makes a statement; it is a stylish fixture, which creates a premium experience for the visitors to your washroom, with a much-reduced cost to the environment.